"To change within, particularly for the better, takes more than a wish. True, the process starts with a volition but thereafter, it ordinarily will take determination, focus and a willing heart. Journey alongside a personal reflection on the influence of others while growing up. Then consider what it takes to change and how the seven deadly sins can sway your impulsive actions and emotional reactions. Contemplate counteractions and self control. 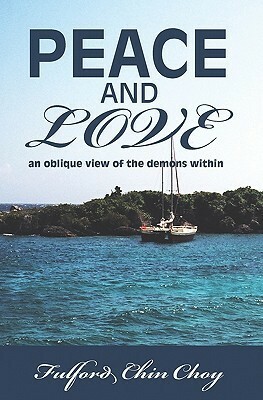 With the insight gained, peace of mind likely can be had with one employing the heart, the mind and the will to do so." A family member who speed read this mystery tells me that the book is really a commentary on the Communist system in China and on the events of the Tienanmen Massacre and some of its consequences. The book is centered on the mystery of the disappearance and murder of a well known pop singer, Kaili. The main character, Wang Mei, is a private investigator in Beijing who is hired to find the actress and who continues to resolve the murder mystery even after being pulled off the case. I am only 2/3 of the way through the book, but I understand it's interesting both politically and as a thriller. I posted four reviews instead of my usual two last week! That meant I had more time to read and my periods of relaxation are extending, a countdown to when I truly will be free to do as I please with the hours of the day! I read four books by women writers, two mysteries and two fiction. 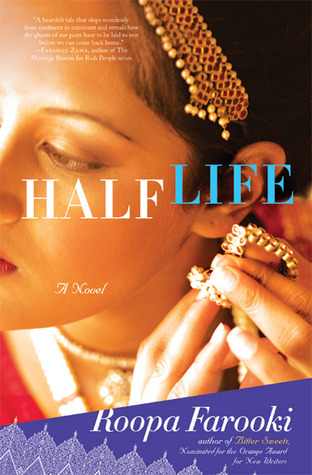 Blood Hina by California crime writer, Naomi Hirahara; A Twist of Orchids by Michelle Wan, who writes mysteries set in the Dordogne, France and a book of contemporary fiction, Half Life by Roopa Farooki of England and France, a book with a good story. 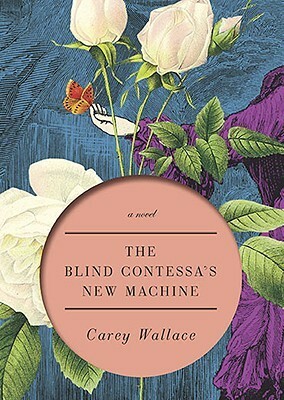 Also reviewed a delightful historical fiction set in 19th century Italy, The Blind Contessa's New Machine by a talented young writer Carey Wallace, who is at work on five other books! She confesses this in her interview printed with the book review. I tried a poem shaped like a tree in Magpie Tales: Tomato Ornaments, inspired by a photo prompt of tomatoes ripening on the vine. Check it out! Diane Meier's The Season of Second Chances: A Novel I am enjoying more than I thought I would. A 48-year-old professor of English Literature moves from a drab life at Columbia University in New York City to a life of friendship and promise in Amherst, Mass. Right now, she is renovating an old, run-down Victorian house, turning it into the Apricot House with the help of handyman/interior decorator Teddy, a thirty-something who reminds her of the brother she lost many years ago. My first attempt at writing fiction - I started to write about a man living alone in the U.S., whose wife has died and whose children live elsewhere. I hope it will lead somewhere! The Blind Contessa's New Machine: A Novel by Carey Wallace, published 2010. My comments: Wonderful descriptive writing, capturing the surroundings and the delicate feelings of the Contessa Carolina Fantoni during the gradual loss of her sight. We follow her amazing ability to cope with daily life. The book is set in Italy in the early 19th century. I read it as the story of a young woman's coping with a new husband and home and the narrowing of her world visually. Carolina, the Contessa, relies on the devotion of a friend Pellegrino Turri, an inventor who creates and makes a typewriting machine for her to continue her correspondence with friends. Turri is also married, but his relationship with Carolina develops into much more than ordinary friendship. Carolina also has her dreams, which allow her to create a new world for herself. I found this part of the novel lyrical and insightful, and the emotional journey of the Contessa poignant, her story bittersweet. For those first several weeks, the darkness was complete. But then Carolina began to see again in her dreams. At first the glimpses were so slim, they might only have been memories; the sun blazing through the new spring leaves, which seemed to be in danger of disintegrating in its rays; a box her mother kept by her bed, red cloth, embroidered with a white parrot; a silver bowl full of lemons. The ending of the novel was an interesting surprise, subject to more than one interpretation, but the basic facts follow the true story of the Contessa and her intimate friend. Here is what Carey Wallace, the author, has to say about her novel. Welcome, Carey! 1. What inspired you to write an historical novel set in Italy? The evocative details of the actual invention of the typewriter inspired me to write the story: a beautiful blind woman, an inventor who’s inspired to create the first typewriter out of love for her, and the fact that they were both married to other people. The added fact that the typewriter really was invented in Italy was just another lucky element in a wonderful collection of historical scraps. But I was delighted to get to create a corner of a fictional Italy, since I think Italy occupies a special place in the imaginative landscape of the whole world: from the Greek and Roman myths that still dominate so much of western fiction, to more modern writers like E.M. Forster who find Italy to be a playground for the imagination – it’s a place where, at least in literature, anything can happen. 2. How much of your book is based on actual people and facts? When the first typewriter was invented, nobody knew it was the first typewriter. The inventor wasn’t the same person who eventually commercialized it, so the historical details are scarce, but I did work within them. The typewriter really was invented by Pellegrino Turri for Carolina Fantoni, a noblewoman who went blind in her early twenties. Using the machine, they carried on a correspondence of only a few years, which ended around the time Carolina’s family moved away from the area. The original machine was returned to Turri’s family upon Carolina’s death, and it does not survive: only a handful of her letters that prove that she was in possession of the first machine to fit the modern definition of typewriter. 3. The description of the Contessa's gradual loss of sight seems very realistic. Do you have first hand experience with people who are blind or have lost their sight? Thankfully, I don’t – although I’ve always valued the fact that my near-sightedness gives me more than one way to see the world. The descriptions of blindness in the story date back almost ten years, to a church retreat when I wound up in a room with a woman who worked for an eye doctor. Over the years, she had learned to read patient tests well enough that she could diagnose problems herself, and sometimes knew that a patient was destined for blindness before the doctor told them. This was a difficult weight for her to carry, and she spent several hours explaining different varieties of blindness to me in extraordinary detail. For years, I struggled to write about this experience. It just never seemed to fit anywhere I tried to put it. But over time, my writing went through a shift. Instead of trying to manage the trauma of the world through my work, or even to bear witness to it, I got interested in creating new worlds. Pain still had a place, but it was transformed. And the simple stories of modern patients struggling as they lost their sight finally emerged, reborn as The Blind Contessa’s New Machine. 4. How much and what research did you have to do for the novel? As a writer, I’m interested in evocative scraps of history that provide jumping off points for the imagination. The story of the invention of the typewriter is an almost perfect example of this: a small but wonderful group of facts mostly garbled beyond recognition on the internet or collected with more accuracy in out-of-print books by typewriter aficionados. I tracked down the previously-printed facts thoroughly, but there weren’t many to find, which gave me the leeway to create with abandon around the kernel of the true story. 5. I was a little puzzled by the ending. Can you enlighten us a bit about your decision to end the novel in the way it did? The Blind Contessa’s New Machine really has two distinct narrative arcs: one that tells the story of the romantic complications surrounding the invention of the typewriter, and a far more private story about a young woman creating a world of her own making to inhabit as blindness steals the sighted world from her. To me, that story is at the heart of the book, and has a true resolution by the end. The romantic arc, as with so many actual romantic arcs, doesn’t have such neat resolution. That’s deliberate: it’s meant to question whether the meaning of the book was ever really to be found in the romantic arc, and send readers looking for the meaning Carolina finds for herself, outside of the relationships she has with Turri and her husband. 6. Some of your favorite authors and books? Penelope Fitzgerald is my favorite modern author. She began writing fiction to entertain her dying husband when she was already over sixty, and won a Booker Prize less than five years later. Her books are slim, intelligent, beautiful, and so strong you can get drunk on the first sip. She’s got a sharp eye, but a generous heart—a rare combination. And she can set her novels convincingly in Russia, Italy, or on the Thames. Julio Cortazar is the writer I name most often as my favorite: even in translation, his writing breaks into some category beyond prose, and his books work more like dreams than stories. I love Hawthorne best among American authors, followed by Raymond Chandler, F. Scott Fitzgerald, and Tennessee Williams, along with a deep affection for Cornell Woolrich, whose hypnotic prose I sometimes think works not in spite of but because of its imperfections. Dostoyevesky and Tolstoy are always the cornerstones of anything I’ve managed to learn about books, balanced on the side of wonder by Borges and Marquez. A portrait of the Bronte sisters, with their brother Branwell painted out, has hung over my desk since I was a teenager. I’ve read both Gone With The Wind and The Count of Monte Cristo many times. I read Thomas Merton almost daily. And Flannery O’Connor helps me in a host of ways, not least of which is her sheer cussedness. 7. Are you working on another book at this time? I am working on five other books: one about a girl who falls in love with a ghost who can’t remember who he was before he died, one about the secret bride of a train robber, one about a young vampire, one about the relationship between art and faith, and one about my family’s experience with my mother’s chronic illness, lupus – the disease that killed Jack London and Flannery O’Connor. This is no guarantee, however, that any of these will be the next to appear. 8. Is there anything else you would like to add for readers? Just my gratitude to them for being readers. The noise and demands of the world get more crushing every year, and no other art form demands as much imagination, attention, and time from people as a book. I think it’s a small miracle every time someone makes the choice to read, and I hope you’ll find The Blind Contessa’s New Machine offers you a real gift in return. 9. How can readers reach you? I’d love to hear from people through my website: http://www.careywallace.com/, or directly at theblindcontessa@gmail.com. Congratulations again on your novel, Carey, and we wish you the best! About the author: Carey Wallace grew up in a small town in Michigan. She is the founder of the Hillbilly Underground, a retreat in rural Michigan that draws international artists. She lives in Brooklyn, New York and is at work on five other books. The novel: Aruna Ahmed Jones decides suddenly to leave her physician husband Patrick and return home to Singapore where her old friend and former lover Ejaz or "Jazz" lives. In the meantime, in Malaysia, Hari Hassan lays dying in a hospital bed, wanting to reconcile with his son Jazz and even to tell him the truth, finally. My reactions: The stories of Hassan, Aruna, and Jazz intertwine and each chapter returns to events in the characters' lives that have led them to their present situations. Hassan's and Aruna's poignant stories and Jazz's love for Aruna carry us on an emotional journey to face the past and deal with the present. The use of numerous flashbacks in the narrative was distracting, however. I didn't find that the technique worked as well in this novel. The story of Hassan, a very sympathetic character, was not linked to Aruna's story until well into the book, although both stories were told from the beginning in different chapters. But the story, in its entirety, is moving and very worthwhile reading. About the author: Roopa Farooki is the author of The Corner Shop and Bitter Sweets. Born in Pakistan, she grew up in London, attended new College, Oxford, and teaches creative writing at the Canterbury Christ Church University. She lives in England and France. "I'm only orchid-crazy a small part of the year, you know," he said earnestly." The rest of the time I'm a normal, everyday sort of bloke. Please believe me." Location and background info: Mara Dunn of Montreal is an interior decorator and her British partner Julian Wood is a landscaper and orchid collector. Things are testy between the two because of Julian's obsession with finding a rare, possibly non-existent orchid in the mountains of the Dordogne, France, where they live. They become sleuths when strange things begin to happen in the town where they live - a mysterious death of an elderly woman, the disappearance and death of a young man, and the haunting of a widower with Parkinson's disease who swears he has mysterious nighttime visitors. However, Mara and Julian don't necessarily work well together all the time. My comments: Apart from the constant bickering between the two lovers, the plot was enjoyable and original, having all the loose ends tie together nicely and conveniently at the end of the book. But that's one reason I love mysteries - all is solved and resolved in the end and the bad guys get their just rewards. I loved the setting and the description of the forests in the Dordogne. Rating: I would rate this a 4 1/2 out of 5 for plot, characterization, and writing. 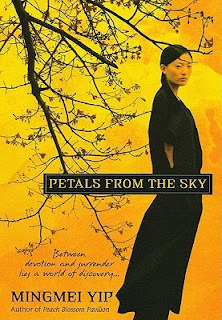 Here is an interview on YouTube with Michelle Wan, who says her book is about "sleeplessness, murder, and a sprinkling of orchids." In this fourth installment of Naomi Hirahara's highly acclaimed "Mas Arai" mystery series, Mas' best friend Haruo is getting married and Mas has grudgingly agreed to serve as best man. But then an ancient Japanese doll display of Haruo's fiancee goes missing, and the wedding is called off with fingers pointed at Haruo. To clear his friend's name, Mas must first uncover a world of heartbreaking memories, deception, and murder. My comments: Getting new information from books, whatever the genre, is part of the enjoyment of reading. I learned about Japanese Hina dolls, which were originally made out of paper to be cast out to sea in a boat, a ritual meant to have the dolls take all the bad luck and bad actions of a person with them, making them the equivalent of a scapegoat. The dolls later became a symbol of good luck for children, the family, and the emperor. They are made of more costly material and brought out on March 3 every year on Hina Matsuri, the Girls' Day Festival. In Blood Hina, the disappearance of two of the valuable dolls is linked to the absence of Mas Arai's friend, Haruo. Then there are murders that deepen the mystery. 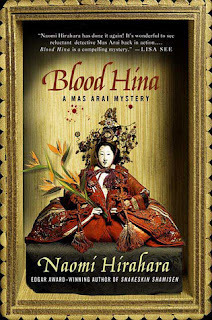 The use of many unusual Japanese words and expressions in Blood Hina made me stop to concentrate on the translation and meaning, and Mas Ari's own strong accent transferred into English distracted from the flow of the plot and action. I enjoyed the first half of the book but got bogged down in the second half with the introduction of many different characters. The information about Hina dolls made the book worthwhile, but I would have liked a smoother reading experience. I liked Hirahara's Snakeskin Shamisen , an earlier book in the series that also features the Southern California Japanese gardener and sleuth, Mas Arai. Happy Fourth of July! The weather has been hot but sunny and it's great to have a long holiday weekend. Saturday night, fireworks were already exploding and car alarms went off each time there was a loud "Kaboom!" It was very funny. I've spent some time looking and reading up on eReaders and have decided on a Kindle or a Nook as a summer present to myself. Should I wait for the new version of the 9" Kindle DX, which will have better E-ink screen and contrast? It will be available July 7 at a reduced price, but will still cost $379. 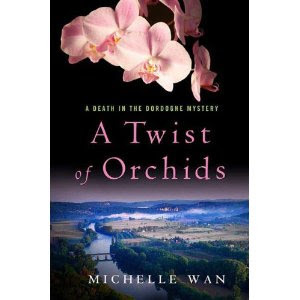 I 'm in the middle of a mystery set in France, A Twist of Orchids: A Death in the Dordogne Mystery written by Michelle Wan. This book is the third in the series. I've also started another novel, Blood Hina: A Mas Arai Mystery by Naomi Hirahara, who has written her fourth book in the series featuring Southern California gardener Mas Arai. I found the books by browsing among the new releases section in our local library. It's good to see a diversity of books and a variety of settings for mystery novels. Another crime novel on my list, from the library, is A Nail Through the Heart: A Novel of Bangkok (2008) by California writer, Timothy Hallinan, who has written several books set in Bangkok. Next week, I'll be moving on to A Cup of Jo (Maggy Thorsen Mysteries) by Sandra Balzo, a cozy mystery set in a suburb of Milwaukee. What are you up to this weekend and what did you read last week? Summary: Twenty-year old Meng Ning decides to be come a Buddhist nun, against the wishes of her mother. She travels abroad to study Buddhism and meets a young American doctor at a Buddhist retreat in Hong Kong. They become close and as they say, the rest is history. Or maybe not...Meng Ning must choose between the young doctor and her wish to emulate the life of a Buddhist nun who had influenced her during her childhood. The book takes place in Mainland China, Manhattan, Paris and Hong Kong. Comments: I learned more about Buddhism from this novel.The story of the Buddhist nun, Yi Kong, Meng Ning's mentor who inspired her to study Buddhism, showed how women fit into the religion. I thought Meng Ning's story could have wrapped up sooner, however. The tension in her relationship between the American doctor Michael Fuller versus Yi Kong her mentor dragged on a little too long, though I enjoyed it as a love story and a story of a young Chinese woman's contact with the life and ideas of the West. 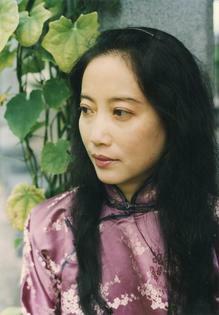 Author biography: Mingmei Yip grew up in Hong Kong and immigrated to the United States in 1992. 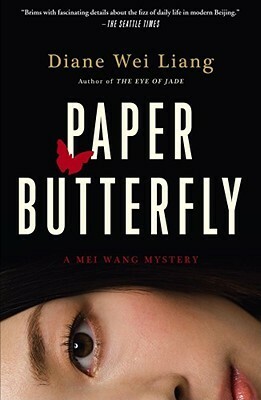 Her debut novel, Peach Blossom Pavilion , which tells the story of the last in the Chinese tradition of poet-musician-courtesans, was published by Kensington in 2008. My rating: 3 1/2 to 4 stars.